"[A]n excellent resource for professionals who want a good means for getting up to speed on the prevention angle. It is all-inclusive from many perspectives – authorship of chapters, rich reference lists, and content (…). This book is a one-stop source for understanding the state of current prevention knowledge about type 2 diabetes." "This is a timely and helpful treatment of an important public health topic. I am unaware of any other contemporary books which address exactly this issue." 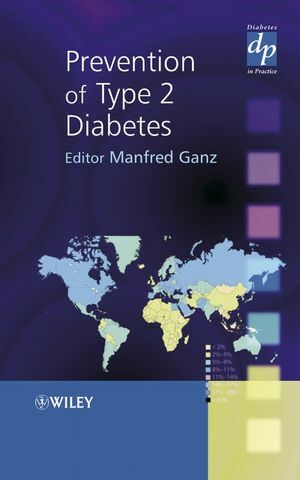 "An ambitious title, written by some of the world’s leading diabetologists, it takes a very careful approach ( …)"
Manfred Ganz, M.D.Specialist Internal Medicine, Diabetologist DDG, Medical Director Roche Diagnostics Global Diabetes Care, Mannheim/Germany. SECTION 1: THE DIABETES EPIDEMIC: DESCRIPTION OF THE PROBLEM. 1. The Diabetes Epidemic; Genes and Environment Clashing (Paul Zimmet, Adrian Cameron and Jonathan Shaw). 2. Type 2 Diabetes Mellitus: Primary and Secondary Prevention The Vision of the International Diabetes Federation (Pierre Lef&egrave;bvre). 3. Type 2 Diabetes Mellitus in Children and Adolescents (Thomas Reinehr and Martin Wabitsch). SECTION 2: SCREENING FOR TYPE 2 DIABETES. 4. Screening for Undiagnosed Diabetes: Whom, Where, When and How (Tim Kenealy, Bruce Arroll and Peter M&uuml;ller). 5. Genetic Screening and Prevention of Type 2 Diabetes (Paolo Pozzilli). 6. Screening Parameters and Techniques: Limitations and Opportunities (Knut Borch-Johnsen and Charlotte Gl&uuml;mer). 7. Screening for Diabetes Mellitus – the World Health Organization Perspective (Gojka Roglic, Rhys Williams and Stephen Colagiuri). SECTION 3: PREVENTION OF TYPE 2 DIABETES. 8. Findings from Preventive Type 2 Diabetes Trials (Markolf Hanefeld). 9. A Paradigm Shift is Needed in the Primary Prevention of Type 2 Diabetes (Jaakko Tuomilehto). 10. The Behaviour Change Process (Frank J. Snoek and Richard R. Rubin). SECTION 4: PREVENTION OF COMPLICATIONS OF TYPE 2 DIABETES. 11. Preventive Disease Management – Risk Stratification as a New Tool in the Hands of General Practitioners (Thomas Konrad). 12. Prevention of Obesity and Lipid Disorders (Hermann Liebermeister). 13. Renal Dysfunction and Hypertension, Focus on Type 2 Diabetes (Carl Erik Mogensen). 14. Diabetic Retinopathy in the 21st Century: Screening and Visual Outcomes (Ayad Al-Bermani and Roy Taylor). 15. Prevention and Treatment of Diabetic Neuropathy (Anders A. F. Sima). 16. The Cardiologist’s View: Prevention of Macrovascular Complications (Michael Faust, Sabine Wiedenmann and Reinhard Griebenow). 17. Milestones and New Perspectives in Prevention of Type 2 Diabetes and its Complications (Carl Erik Mogensen).